If you feel like you’re feeling very tired of being cooped up in the gym day after day after day, it might be time to consider taking your workouts outdoors. Yes, I meant an outdoor workout routine. An outside workout routine can offer the same degree of benefits as a workout you’d do inside but it gives you the change of pace that you crave and some fresh air. Plus, since you’ll have far more room in the outdoor setting to exercise, your choices of activities are greater as well. Let’s take a quick look at a few of the top modes of exercise for you to consider adding to your outside workout routines. The first great workout to do outside is uphill sprints. Sprinting uphill is a perfect way to boost your cardiovascular fitness level and will also challenge your lower body strength as well. Sprint up a nearby hill as fast as you can and then turn around and walk back down again. Once finished, stop and repeat the process another six to ten times. Next up we have bootcamp. Bootcamps are hot right now because of the fact that they’re going to provide both a cardiovascular workout as well as a strength workout in one. If you dislike long cardio sessions, this is the perfect route for you to go. Boot camps also utilize a group atmosphere, so for those social butterflies out there, this is a great option to have fun, get fit, and meet new people all at the same time. Bootcamps are also a cost effective way to get in shape if you do want to be working with a personal trainer. A third activity on the list to consider for your outside workout routines is rollerblading. Rollerblading is going to help to work all the main muscles in the lower body and will boost your aerobic fitness as well. Rollerblade along some scenic trails in your neighborhood and you’ll have a workout that de-stresses you and energizes you at the same time. Jump rope is an awesome workout that can increase your heart rate tremendously in a short amount of time. Skipping with a jump rope will certainly build the strength of your internal organs especially your heart and lungs, therefore making you physically fit in no time at all. You can perform this exercise outdoors because it requires space for you to skip. 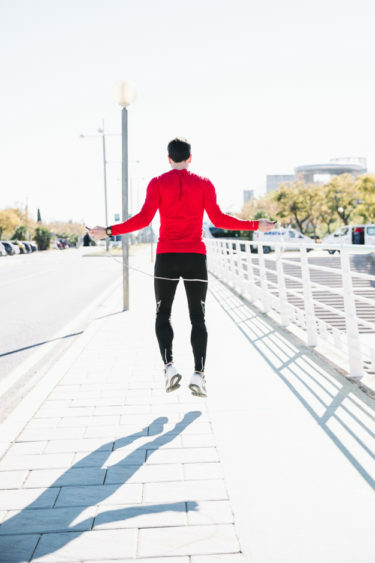 If you are new to jump rope you can start be trying to skip 10-20 seconds at a time; you will see that your endurance will quickly build and build up drastically. Finally, the last workout to consider is a park strength training. Parks offer numerous options to perform different strength based moves as you get fit. Perform pull-ups, hanging leg raises, push-ups, pike holds, lunges, squats, and burpees all while in the park setting. This is a great way to boost your muscle strength using bodyweight activities and stimulate the muscles in a way that is totally different from what you’d do in the gym. Try it, you will be glad you did. So consider these four options as you come up with your outdoor workout routine to do as you progress through your workout program. Getting outside can just be the perfect way to keep yourself motivated.